Why is America mired in a costly, perpetual state of war? 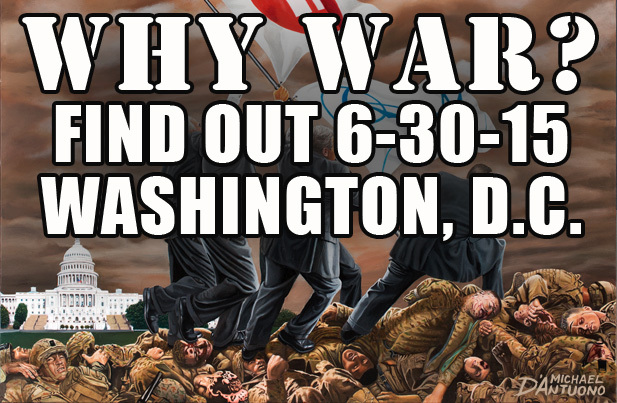 Come to D.C. on June 30th for the opening of the art exhibit, “WHY WAR?” and see the unveiling of Michael’s painting, Profit & Loss’ to find out. The exhibit will take place at D.C.’s favorite gathering place for artists and activists, Busboys & Poets. The opening reception will be held on the 30th between 7-9 p.m. at 5th and K Streets NW. The exhibit runs through to July 11th. This is the painting and the exhibit that is set to launch the new anti-war movement with plans to bring together representatives from the nation’s various peace organizations for a possible convention around the closing of of this exhibit hosted by American University.